Susan PolgarAnand (left) and Carlsen (right) at the 2013 World Chess Championship. The 2014 World Chess Championship begins on Saturday in Sochi, Russia (yes, that Sochi). 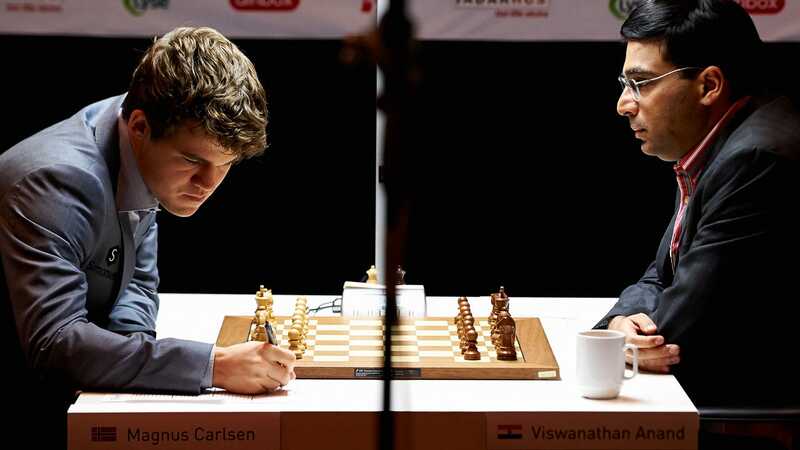 It’s a rematch, and an unexpected one, between the current World Champion, Norway’s Magnus Carlsen, and the former titleholder, Viswanathan Anand of India. 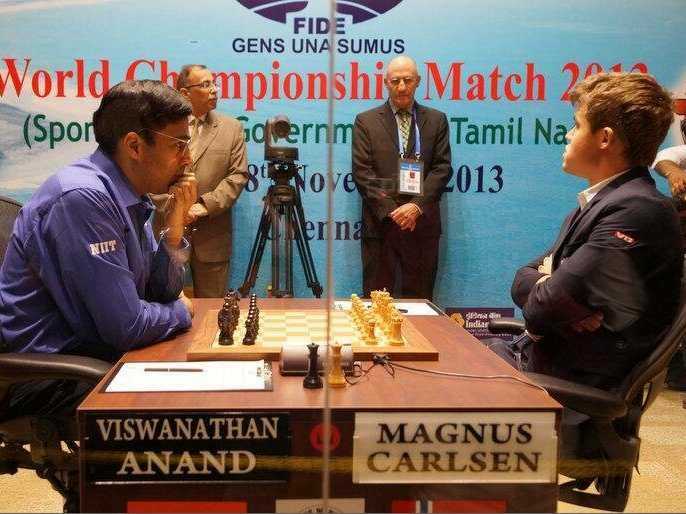 Last year, on Anand’s home turf in Chennai, Carlsen — then just 22 years old — took the crown away from the 5-time champ. The match was scheduled for 12 games, but Carlsen needed only 10 to become the first World Champion from the West since Bobby Fischer in 1972. 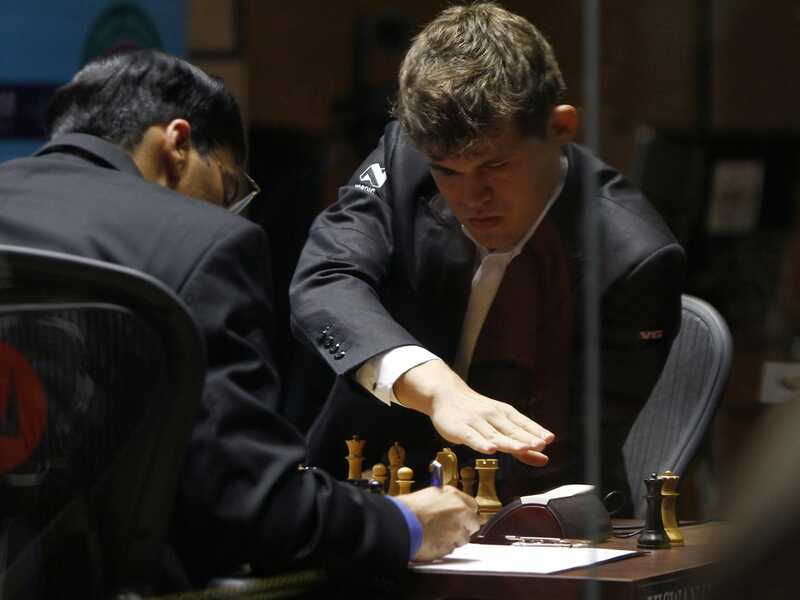 Carlsen, who has since set the chess world on fire and become the global face of the game, defeated Anand in crushing fashion, losing no games and scoring 3 decisive wins. The chess cognoscenti figured that Anand would retire at 44, but he staged an impressive comeback at this year’s Candidates Tournament and won the right to reclaim the title. It wasn’t clear until just about a month ago that he would even be facing Carlsen across the board: the now 23-year-old became embroiled in a dispute with the World Championship’s governing body, the World Chess Federation (FIDE). Carlsen was unhappy about the prize money (less than what he was playing for in Chennai) and the venue (a symbol of corrupt FIDE’s connection with corrupt Vladimir Putin). The dispute was resolved and the two Super Grandmasters will now play another 12-game match, plus tiebreakers if it comes to that. Carlsen is the highest-rated player in the world at 2863. Anand is substantially lower, at 2792. This means that, statistically, Carlsen should win. But of of course, Anand cut a swath through younger and higher-rated players at the Candidates Tournament, and some observers expect his form to be better than last year. Wins will count for 1 point, losses 0, and draws half a point. At FiveThirtyEight, Oliver Roeder has broken down the odds. The first game is Nov. 8, and the match could run nearly through the end of the month, a game per day with a number of break days. So what should you look for, if you watch the games live online or review them later? 1. Does Carlsen seem as dominant coming in this year as he did last year? Carlsen was the undisputed King of Chess in 2013. He had surpassed Garry Kasparov’s highest-ever rating, had beaten everyone at the upper-reaches of the chess hierarchy, was modelling for G-Star Raw and being profiled by U.S. TV shows and magazines, and — most importantly — was intimidating. It looked like it was his time. And as it turns out, it was. A year later, Carlsen is as dominant as ever but there have been some wobbles. The U.S. number one (and world number nine), Hiraku Nakamura, nearly defeated him by pursuing an attacking line similar to one that Anand attempted, unsuccessfully, in Chennai. The Italian number one (world number two), Fabiano Caruana, defeated Carlsen in a tournament in St. Louis en route to a decimation of the chess elite, a performance that had many comparing the 22-year-old Caruana to Fischer (Seth Stevenson chronicled the performance for Slate). There’s a lot of people who think that Carlsen-Caruana, a showdown between the world number one and world number two, should be the World Chess Championship matchup. In any case, Carlsen’s form of late hasn’t been quite as daunting as in 2013, so if Anand can make a few more games into tactical battles, avoiding draws (tough to do at the Super GM level) and gruelling endgames (a Carlsen specialty), then he might have a shot. REUTERS/Kent SkibstadWill Anand play aggressively from the first moves? 2. 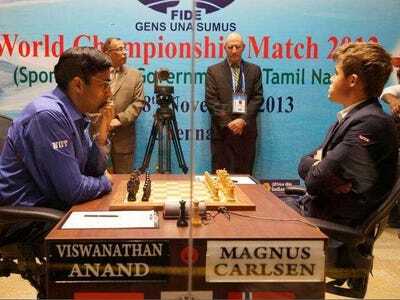 Will Anand play aggressively from the first game? Last year’s match began with four draws, then two wins by Carlsen, which spelled the end of Anand. Anand is a powerful player who can play “universal” chess, attacking and defending. At his age, however, he probably won’t want to make the mistake his did in 2013, accepting early draws to test Carlsen’s ability to handle the pressure of the event. Anand literally has nothing to lose at this point in his career, so he might as well rip into Carlsen from the get-go and see if he can pursue some sharp lines and dynamic positions, playing free-flowing chess. Anything to prevent long battles and the type of grinding endgames where Carlsen can use his computer-like positional understanding to play so precisely that Anand will crack. REUTERS/BabuYour tricks won’t work on me. Prior to Carlsen, Grandmaster-level play was all about preparation and the first 10-15 moves of the game, so-called “opening theory.” The book on Carlsen in 2013, however, was that he didn’t want to get bogged down in openings and would rather just get a more-or-less even position and then “play chess,” challenging his opponents to avoid errors over the course of hours and hours at the board. If it goes this way again in Sochi, Anand will likely lose as Carlsen is still the best endgame player around and very good at turning lost positions into draws and even wins. But if Anand can entice Carlsen to allow the openings to yield sharp positions, he may be able to create some middle-game opportunities and force Carlsen defend creatively and counterattack, playing serve-and-volley rather than grinding everything out from the baseline. It could be fantastic contest. Or it could fizzle. But I have a feeling we’re going to know in the first game or two what to expect from the match. I’ll be following the games and writing short summaries the day after, so check back for results and a bit of analysis.